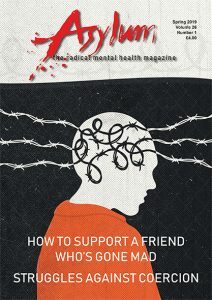 Asylum Magazine for Democratic Psychiatry has been running for 30 years, acting as a platform to voice and discuss all perspectives on mental health. Subscribe to have printed or digital copies sent to you. Annual subscriptions and your contributions ensure the future of this publication. 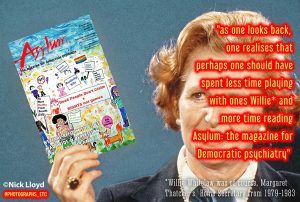 The views expressed on the Asylum magazine website are those of individual contributors and not necessarily those of the collective. Articles are accepted in good faith and every effort is made to ensure fairness and veracity. If you are looking for a particular article please use the search facility.